Backstory: ﻿“Y U NO” Guy is used to bring someone’s attention on a particular subject or issue. Y U NO Pay Me Back? Y U NO Love The Big Mac? 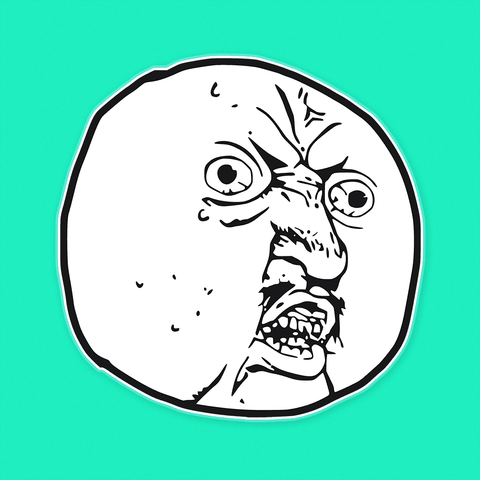 The expression brings together the frustration of not having an answer to Y U NO? mixed with the desperation to get one. The unique facial expression worn by stick-figure character is believed to have been traced from the Japanese sci-fi manga / anime series Gantz. 🤩DON’T JUST WEAR THE CELEBRITY, BECOME THE CELEBRITY - The expression brings together frustration of not having an answer to Y U NO? mixed with the desperation to get one at Halloween parties, festivals & concerts.